The application of platelet-rich fibrin (PRF) is gaining popularity in the treatment of bony defects as an endogenous regenerative therapy. The fibrillar aggregation matrix is incorporated with cells, cytokines, and growth factors and is released with time when inserted into implant, oral and maxillofacial surgery, and periodontal surgeries to promote healing. This paper evaluates the wide application of PRF in the regeneration of intrabony defects. A literature search of PubMed, EBSCO, and Google Scholar databases was performed by two reviewers for articles, published from January 1, 2002, to December 31, 2016, followed by a manual search of several dental journals. Weighted mean differences (MDs) and 95% confidence intervals (CIs) were calculated for pocket probing depth (PPD), clinical attachment level (CAL), gingival margin level (GML), and defect fill evaluated from baseline to the end of follow-up. Nine randomized clinical trials were included showing overall standardized MD in two groups for CAL as 1.194 (93% CI: 0.919, 1.362, P = 0.0001); for PPD as 0.034 (95% CI: 0.820, 1.248, 0.0001); for GML as 0.244 (97% CI: −0.016, 0.472, P = 0.024); and for bone defect reduction as 1.789 (98% CI: 1.493, 2.084, P = 0.0001). The results of the meta-analysis seem to support the effectiveness of PRF in the treatment of intrabony defects. There was an overall reduction in PPD and gain in CAL and GML and defect resolution. This proves that the application of PRF in the regeneration of intrabony defects has a promising future but should be used with caution with the heterogeneity present in the studies for gingival margin level. Photography is one of the Diagnostic Tools for communication, Diagnosis and Documentation. Lots of diagnostic information regarding Intra-oral as well as extra-oral features can be captured with this tool. Photographs are excellent tools to educate patients and to show the progress of the treatment. Even though the cephalogram can gives an accurate information regarding hard tissue anomalies, its correlation with soft tissue dynamics is also essential. With the advent of digital photography there is a paradigm shift in the diagnosis of facial anomalies and structures. Aim: The aim of this study is to correlate the features of palmer dermatoglyphic with aggressive, chronic periodontitis, and periodontally healthy controls. Materials and Methods: A total of 45 patients with mean age of 18–45 years were equally divided into three groups comprising 15 patients in each group as follows: Group I-periodontally healthy, Group II-aggressive periodontitis, and Group III-chronic periodontitis. 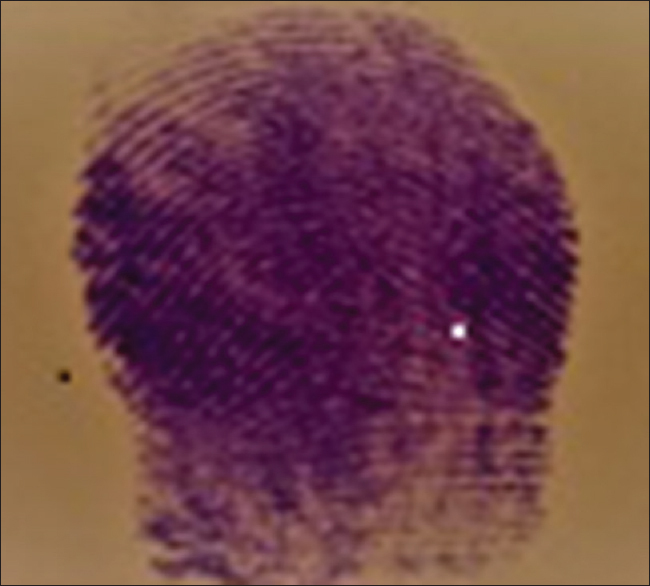 The fingertip patterns of all the patients in each group were obtained and analyzed with the help of magnifying glass. The collected data were subjected to statistical analysis. Results: An increased frequency of whorls was found in patients with aggressive periodontitis and chronic periodontitis, whereas increase frequency of ulnar loop was found higher in the healthy group. Conclusion: Within the limitations of the study, it was found that whorl patterns were in greater frequency in aggressive periodontitis patients. However, further studies with larger sample size are required to arrive at a conclusive report to correlate dermatoglyphic patterns in patients. Background: As there is an increase in issue identified as musculoskeletal disorders (MSDs) in the field of dentistry, dental specialists are unconscious of this until the point when they encounter. Hence, it should be included in the curriculum of preclinical undergraduate students to make them aware and to adopt preventive measures to avoid them. Aim: The aim of the present study was to assess the knowledge of ergonomics in preclinical undergraduate students. Materials and Methods: The study conducted was questionnaire based with 100 participants, who are BDS II-year students performing prosthodontics preclinical exercises. The participant was approached through a printed questionnaire which included the purpose of the study followed by informed consent. Results: Our study revealed that students were experiencing pain and discomfort during preclinical exercises. And, they were aware of the fact that it was due to incorrect working postures. However, they did not know the precautionary measures to be taken to avoid this problem, and they were keen in learning the correct working measures. Eighty-five percent of students thought that it should be included in the curriculum, and professors should decide the same. 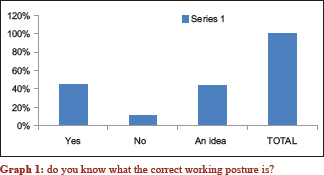 Conclusion: There is a strong relation between the incorrect working posture and the MSDs. As 51% of students experienced pain and discomfort during preclinical classes in our study, it is necessary to include the knowledge of ergonomics in the curriculum and practice of the same. Background: The aim of the present study is to determine the effect of commercially available anticalculus toothpaste and commercially available fluoridated toothpaste on calculus levels of autistic patients and to compare the efficacy of both the pastes. Method: Forty patients were enrolled in the study and randomized in test and control group by lottery method. Test group received anticalculus toothpaste and the control group received commercially available fluoridated toothpaste. Patients received washout toothpaste for ten days prior to commencement of the study. The gingival index (GI), Plaque index (PI) and Volph-Manhold calculus index was measured at baseline 4,12 and 24 weeks. Adverse events were monitored. Result: A statistically significant reduction in the plaque scores was seen over a period of 24 weeks in both the groups (P < 0.05). A statistically significant reduction in the gingival scores was seen over a period of 24 weeks in both intragroup and intergroup comparison. No statistically significant reduction in the calculus group was seen in intragroup and intergroup comparison over a period of 24 weeks. 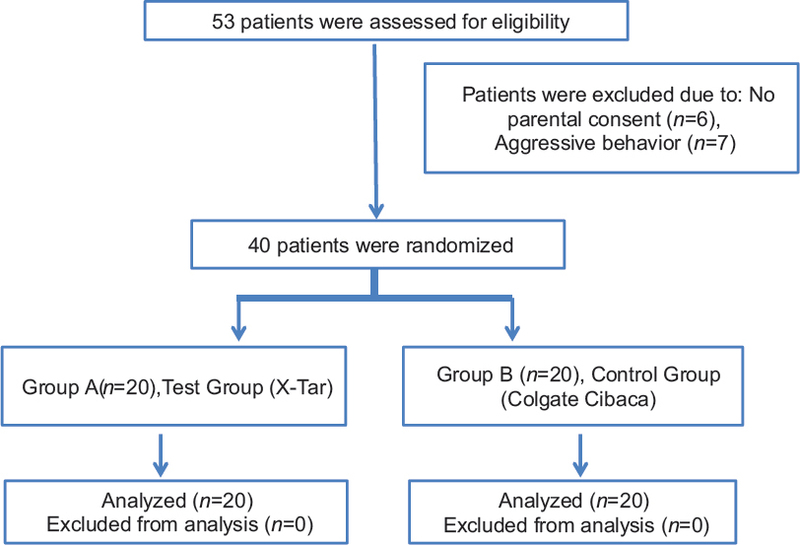 Conclusion: The anticalculus toothpaste did not show any statistical significant changes in the calculus score in intragroup and intergroup comparisons. Thus an oral health program that emphasizes prevention and visual learning is considered of particular importance for children and young people with autism. Introduction: Remodeling of bone and pneumatization of maxillary sinus posttooth extraction results in loss of residual bone height in maxillary posterior segment. Hence, maxillary sinus elevation procedure is a commonly practiced procedure for the placement of dental implant in maxillary posterior region with inadequate residual bone. Various graft materials are being used in the space created after elevation of sinus membrane to maintain sinus lining in place and formation of new bone. 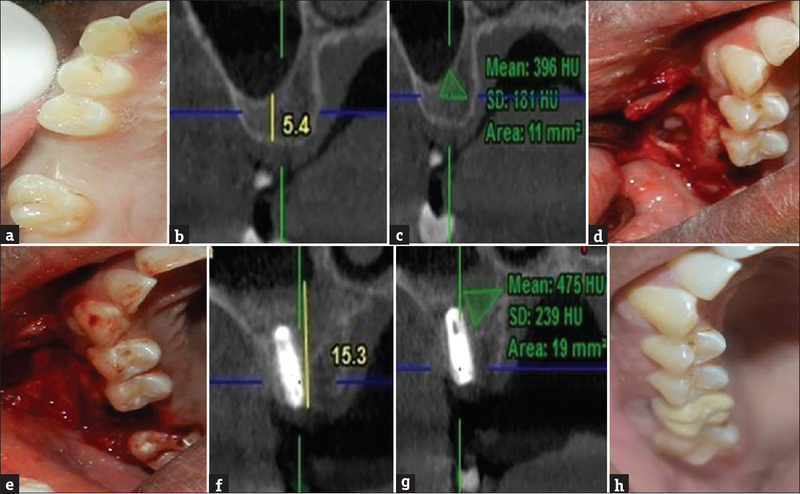 Aim and Objective: The aim of this study is to compare efficacy of calcium silicophosphate putty and particulate xenograft material in direct maxillary sinus elevation procedure, clinically as well as tomographically. Materials and Methods: Twenty patients with the residual alveolar bone height between 3.5 and 6.5 mm in the edentulous maxillary posterior region requiring direct maxillary sinus lift were selected for the study and divided into two groups. In Group A, calcium silicophosphate putty (NovaBone® Dental Putty) was used as graft material and in Group B, particulate xenograft (Bio-Oss®) was used. In both the groups, simultaneous implant placement was done after maxillary sinus elevation. Patients were assessed radiographically (cone-beam computed tomography) after a period of 6 months for increase in bone height and density of new bone formed. Results: The mean increase in bone height postsinus elevation was found to be statistically significant with xenograft (9.8 ± 1.21 mm). It was also found that the new bone formed postsinus elevation was much more denser than existing bone in cases where xenograft was placed in cavity postsinus membrane elevation (759 ± 211 Hounsfield unit). Conclusion: All the implants placed were successfully rehabilitated. Statistically significant difference was observed an increase in bone height and density of new bone formed with xenograft. Context: The purpose of this study was to asses oral and periodontal status of the patients with tuberculosis (TB) at various TB hospitals in Vidarbha region of Maharashtra state, India. Aim: The aim of the present cross-sectional observational study was to assess oral and periodontal status in TB patients at four different centers in Vidarbha region of Central India. Settings and Design: This study was a cross-sectional observational study. Subjects and Methods: The study population consisted of 127 patients aged 13–80 years admitted in wards of four different centers around Sawangi. The soft-tissue lesion and periodontal index were assessed using specialized design proforma. 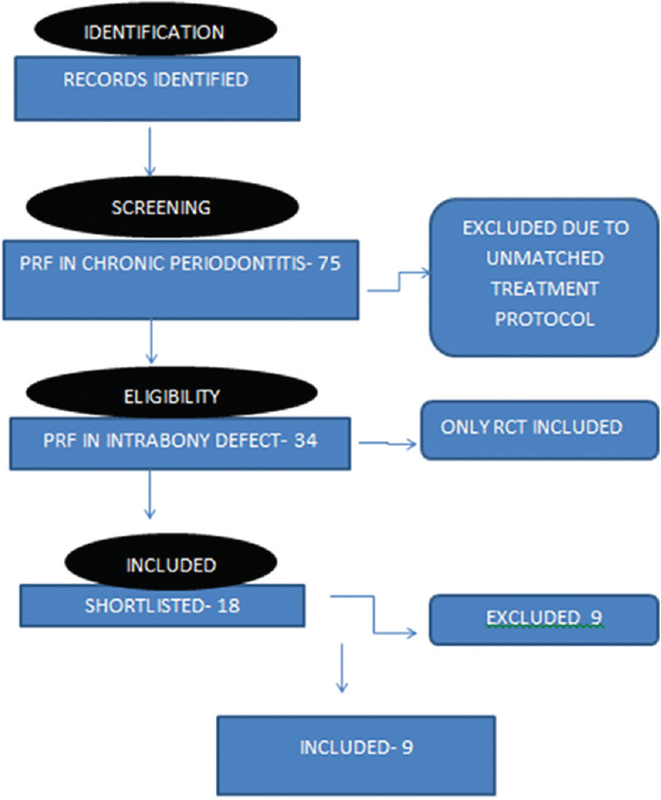 Results: None of the patients reported with healthy periodontal status. Oral lesions were observed in 48.03%, with most frequent sites of involvement were tongue, buccal mucosa, and soft palate. A majority of patients had generalized periodontitis. The prevalence of HIV-positive patient was 7.87%. The mean debris score was 1.35 ± 0.66 and mean calculus score was 1.21 ± 0.60 followed by pocket and clinical attachment level in the range of 1.77 ± 0.56 and 2.81 ± 0.71, respectively. 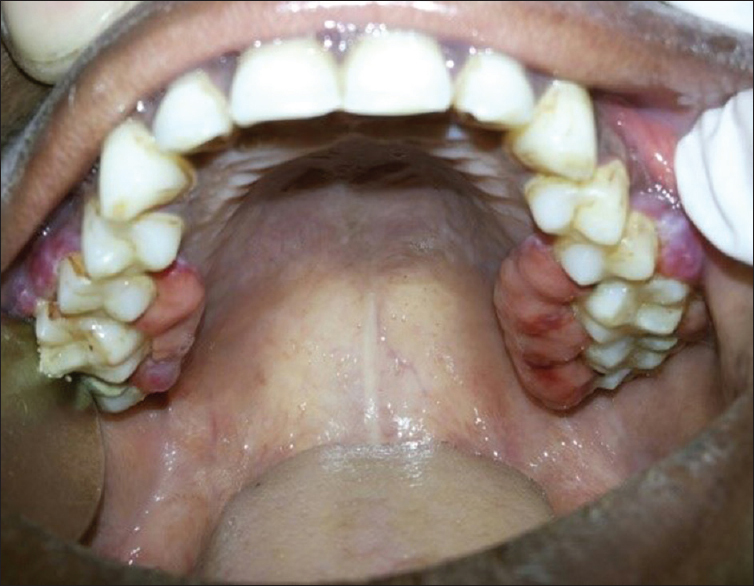 Conclusions: The oral health professional should be made aware to treat the oral lesions in patients with TB with greater caution as the incidence of periodontal diseases and oral lesion, and HIV has become alarmingly higher with these classes of patients. 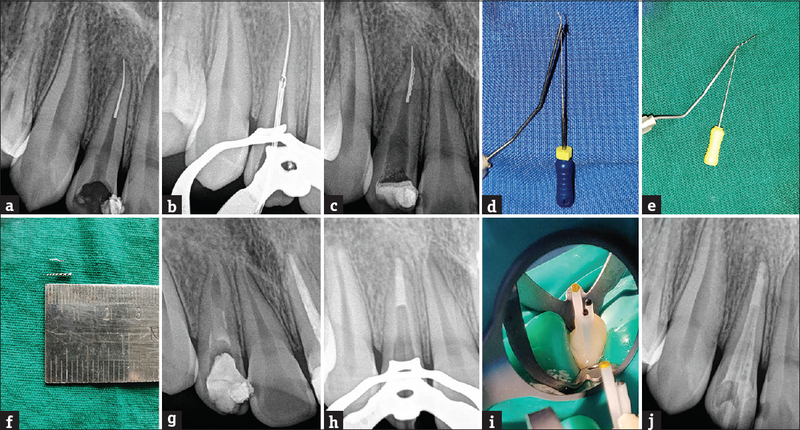 Instrument separation is one of the most common procedural errors that may occur during endodontic treatment. A separated instrument can create an obstruction in the root canal which can hinder the cleaning and shaping procedures. If an instrument separation takes place, an attempt should be made to retrieve the instrument and if retrieval is not possible, the instrument should be bypassed. Nickel–titanium (NiTi) instruments have several advantages, such as superelasticity and shape memory, which prompted their use in endodontics. Due to these characteristics, NiTi instruments have shown to preserve the original anatomy and shape of the root canal. However, the disadvantage is that they fail to show signs of fatigue prior to fracture unlike stainless instruments. 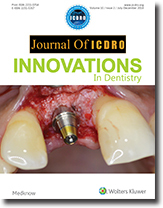 This article describes a case report showing the successful use of a modified tube, loop and file technique for the retrieval of two separated instruments, from a maxillary lateral incisor of a 14-year-old male patient. 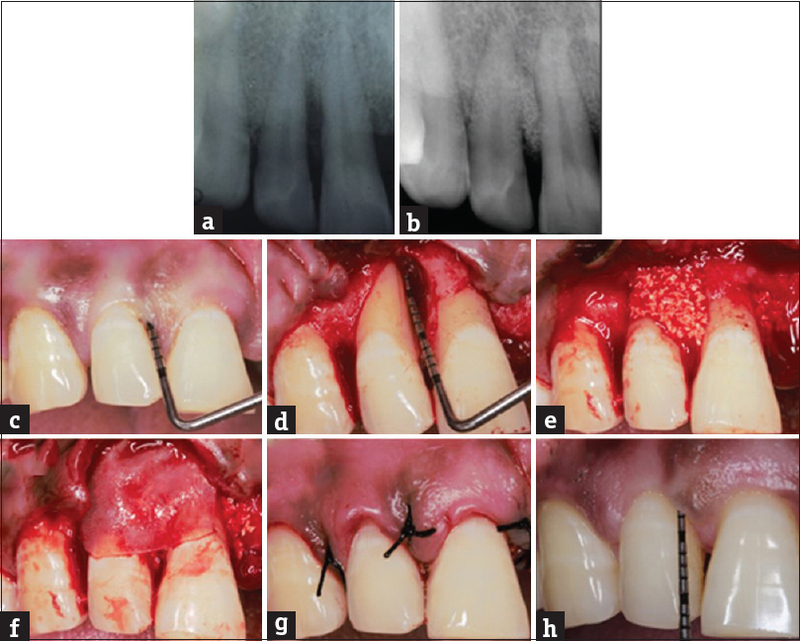 This article reports the outcomes of judicious management of periodontal intrabony defects in the anterior maxilla with a long-term follow-up. Two cases reported with a deep probing pocket depth along with an osseous defect due to chronic periodontitis. After completion of nonsurgical periodontal and endodontal therapy, guided tissue regeneration was undertaken for both the cases. Freeze-dried bone allograft along with a biphasic cross-linked collagen membrane was used in the osseos defect. The patients were then recalled for professional scaling on a regular basis. The long-term follow-up of both the cases showed a resolution of the probing pocket depth and radiographic evidence of bone fill in the osseous defect with stable results. Internal resorption is a relatively rare resorption of dentine, which starts in the pulpal cavity either in the pulpal chamber or in the root canal and destroys surrounding dental hard tissues. The initiating factor in internal root resorption is thought to be trauma or chronic pulpal inflammation, but other etiological factors have also been suggested. 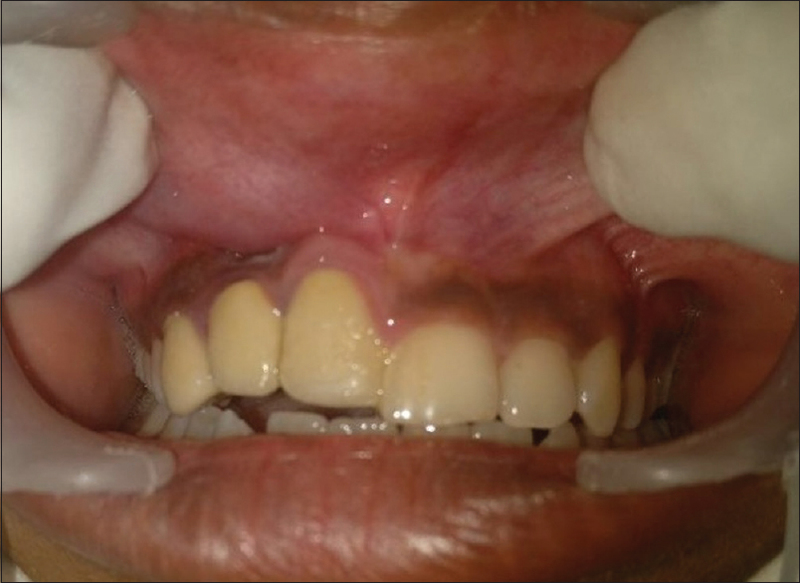 In this article, we report a rare case of complete root resorption of maxillary anteriors in a 23-year-old female patient.